Moscow is rich in both famous creators in all the arts and sciences, and in sculpture. Here are four of Russia’s greatest scientists, all immortalised in granite. Can you name them, and match them to their achievements, and dates? Now the weather is better, better to go and greet them, all outside MGU enjoying the view from the Sparrow Hills. Easter is the most important festival in the Christian year. Many symbols and images are used around the world. Which cross goes with which branch of Christianity? What do the other symbols mean? 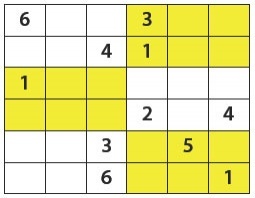 Fox cubs & Easter eggs please decorate this puzzle with Easter eggs! Do you remember Lisa’s four cubs? They eat far too many eggs at Easter time. But how many? Masha ate 2 fewer than Dasha. Sasha ate 3 times as many as Masha, and Boris ate 3 times as many as Dasha. In fact, Boris ate as many as the other three put together. How many did each fox cub scoff? Usual rules: 1-6 in each row, column and box. Armchair Art St Basil’s Cathedral , by Aristarkh Lentulov, 1913; Mower, by Kazimir Malevich, 1930 (this version by Gregory Portner, Y9 at EIS). 36 + 25 + 16 + 9 + 4 + 1 = 91. And the pattern? Each of the totals is a square number in itself.